At Ashfield Cycles our philosophy is simple – our aim is to help you get the most out of your cycling. 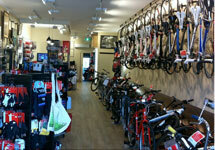 We love everything about bikes as we are Sydney’s leading inner west cycling store since 1978. We supply top quality equipment and with the advice of our expert and professional staff members, finding the right bike that will suit your needs is hassle free. Feel free to visit us at our modern showroom or contact us for expert advice. Ashfield cycles now stocks a full range of Avanti bikes. Come in store today to learn more about the range! Ashfield Cycles will be closing for a few days over the Easter/ Anzac Day holidays to spending some time riding our bikes, and chasing Easter eggs with our families. Thank you for you patience and happy riding!